We are very proud of our fine teaching staff, all of whom are carefully chosen professionals in the child-care field. The teaching staff is rounded out with dedicated, experienced, nurturing professionals, plus classroom assistants, who fill their days with smiles, energy and enthusiasm to ensure that the children experience fun and happiness as part of their learning environment. Questions? Please contact us anytime! We look forward to hearing from you and are happy to provide additional information about anyone on the Swiss Learning Center team. Ms. Olivia is our go to at Swiss Learning Center and Junius. She knows the minimum standards well and strives to make both centers the best they can be! With 24 years of working in the childcare industry she knows what works and what doesn’t. Working with all ages her calling was Pre-K she is a mastermind with 3 to 5 year old’s but at the end of the day she loves all of her babies. On her down time she enjoys spending it with her husband and grandson! With her only having one child she enjoys being able to love on her grandson whenever possible. Ms. Natalie, born and raised in Dallas, she started her experience since she was 12 years old volunteering at theDay Care her mother worked for. Working with Infants and Young Toddlers and older children as well, she has worked with all ages. She also was part of her high school FTI program which includes making a weekly curriculum and teaching a Kindergarten class once a week. Ms. Natalie comes from a family of 3 which includes her and her parents, she is an only child. Her biggest strength are being patience, working well under pressure, being a dedicated and hard worker, also willing to find new ways to improve. As for her hobbies, she enjoys spending time with her family, working on her fitness, discovering new places and dancing. Ms. Cinthia is the middle child from her sisters. She was raised in Dallas and loves the city. Cinthia has a huge passion for children and being able to help them create art, sing songs, and reading to them. She has been in all fields in the childcare field and is excited to be in the position as Assistant Director. Her creative skills and wanting to be there for her teachers are two of the many things she brings to the center. Her greatest weakness is the children's sweet faces and the biggest strength is her vision for future. When she is not working she spends her time with her family and loves being outdoors. Hiking and going on walks are two of her favorite things along side her huge puppy that she just added to her family. Ms. Latosha is from Odessa, Texas and as much as she loves Dallas it doesn't come close to her hometown. She is a wife and a mother of 4 and has one grandson who completes her world! Latosha comes with 4 years of experience and feels that infants are her calling. There is nothing more satisfying to her than watching them grow and her being apart of the process. She is very patient and loves to nurture her current babies. In her free time, she enjoys spending time with her family and making home cooked meals. Watching TV and spoiling her grandson are her two favorite things. An asset Latosha brings to our center is her positive energy and giving those same vibes to the babies. A big strength of hers is helping others stay calm in a time of panic and stress. Ms. Fabiola's experience comes from volunteering at church and from a Teacher Internship. Her greatest strength is the love that she has for kids. Her biggest asset that she brings to the Center is her love for the kids. She knows when is time for fun and time to be serious and her fluency in English and Spanish. She is the mother of one little boy who is 2 years old, and the light of her life. Her biggest reward as a Teacher is to see how the children grow to love you and being able to watch them to grow too. Ms. Karina has a passion for kids and enjoys using arts & crafts daily and is always trying to incorporate the children. Karina has worked in the child care field for 3 years and loves it very much. She comes from a big family and enjoys spending her time off with them and loves going on walks. What is most rewarding for her would be seeing the children excited to come to school and her being one of those reasons. A challenging area for her would be when a student of hers is sick and she can't help them or ease their pain. Assets she brings to our center would be her sweet persona and her ability to learn quickly. A great strength Karina has is her patience! Ms. Emilee is a lover of Dogs her fiancée and her have 2 dogs of there own and they can't get enough. Ms. Emilee was born and raised in Wisconsin and moved to Dallas in 2017. She definitely agrees that everything is bigger in Texas! Emilee has had previous experience working with children as she used to babysit and was a nanny prior to working for us and also worked at a daycare back in her hometown. Creativity is her middle name! She loves to use imagination and is a major fan of using bright colors when decorating her classroom. If you ever walk past her class you will never see it empty. Emillee is a huge fan of Target! It's not a complete week without making a pitstop there. It is very rewarding for her to see her children interact as she is teaching, for her that is very rewarding and a great feeling. That lets her know they are enjoying learning and are interested in her teaching ways. When she is not working she enjoys spending her time with her family which includes her son and husband. She definitely enjoys shopping as well! A great asset she brings to our center is her creativity, positivity and attitude! Her greatest strengths are doing awesome arts & crafts! Ms. Nece is originally from Odessa, Texas. She moved here recently due to being closer to her family! She is a movther of one and enjoys spending all of her free time with him and her family. Watching reality TV is another favorite things to do on her free time. Decorating things is a thing Ms. Nece loves to do especially at our center. She has a certain vision and she puts it into our boards, doors, and her classroom! Ms. Nece enjoys being in her class it is one of her favorite ages to teach! it's where they are learning how to walk, share, eat on there own, and preparing them for the Young Toddler classroom! She loves to snuggle up to all of her children as her son is growing she gets her fix with her babies. She hopes to continue to grow with us and hopes her children grow alongside with her. Ms. Nece is very happy to have found our center! Ms. Luz enjoys being with babies very much! Being able to make them feel safe and happy is what she enjoys about this field. Luz is always willing to learn new things and is very open-minded. She enjoys focusing on fun and educational activites. Luz is bilingual and makes sure to incorporate that into teaching and when singing and reading books. Her number 1 priority is the happiness of the children. She is a mother of 2 and loves every minute of it! When she is not working she likes to take her daughters on walks or to the park. Camping and staying active are on the top of her free time list! A great strength she brings to our team is her passion for the children and striving to do her best at all times and most importantly honesty. Ms. Kiara has a passion for children! She began at another daycare center as a Young Toddler teacher for a year and that’s when she fell in love with children. She is currently in college to pursue a degree in teaching, as much as she is loving the childcare field she hopes to one day be in a classroom and have the ability to nourish and guide small minds in an elementary school. 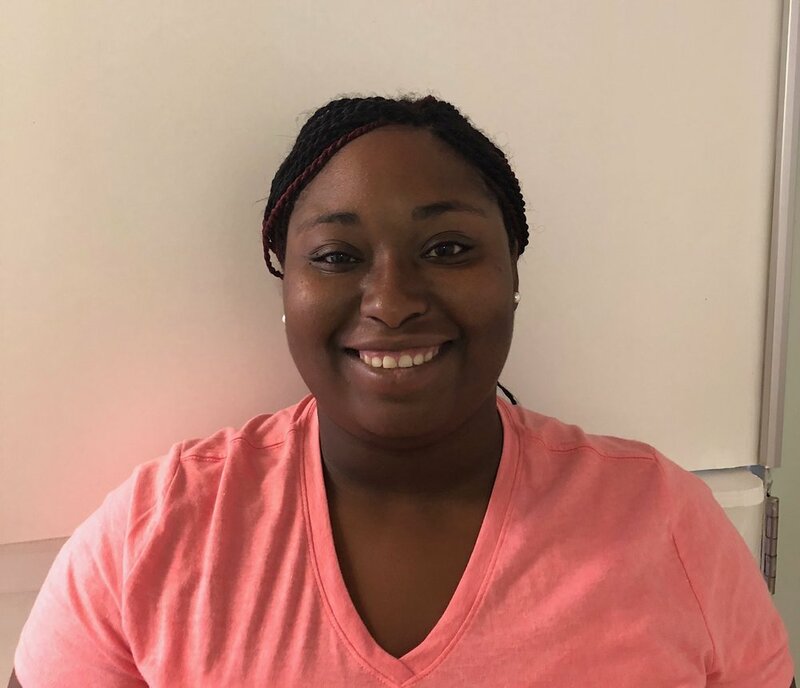 Kiara feels she has a connection with children and babies and understands them, as an infant room teacher she loves to spend time with the children and really help them grow and reach their milestones. Ms. Kiara has a son of her own named Karter and she enjoys every minute of being a mommy, she is happy that Swiss gave her the opportunity to have her son at the same center she works for! On her off days Ms. Kiara spends it with her family and husband. Movies, walks, game nights with the family and of course a little (me) time are her favorite things to do! Ms. Samantha is a fellow Junius Learning Center employee. She began as a floater and then as a Pre-K teacher and loves being able to prepare them for Elementary School. Samantha comes from a family of 3 her being the middle child. On her free time she enjoys doing nails, makeup, and DIY projects and collecting sneakers it is a huge obsession of hers. They key to success is having an open mindset and understanding when it comes to children is what Ms. Samantha believes. Also being able to let them express themselves through crafts, coloring, singing. and dancing as well. They are only children once and she hopes to let them explore to there full potential while also getting them ready for big school. Ms. Karla has 3 years experience with infants and feels it’s her strongest suite in the childcare field! Having tried other classrooms throughout her years she always ends up wanting to be back with the babies. Her goal is to always try and sooth her crying babies and figure out what they need while in her care. Ms. Kara is a mother of one and she loves to spoil her little girl! On her days off she enjoys exploring Dallas and attending any kid friendly events with her daughter! Ms. Kemberly is a full time college student, on her of time she works at our center and enjoys being where she is needed. Ms. Kemberly has worked with all of the ages in our center and enjoys babies the most. She comes from a family of 7 her being the 3rd youngest. On her of time she enjoys walks by the lake, studying, reading a good book or finding some great finds at a thrift store!